Few Americans may be aware of it, but in early December 1952 a killer fog that contained pollutants covered London for five days, causing breathing problems and killing more than 12,000 people of all ages, sending more than 150,000 to hospitals, and killing thousands of animals in the area. It is still considered the worst air pollution event in the European history. The exact chemical processes that led to the deadly mix of fog and pollution have not been fully understood over the past sixty years – until now. Scientists have now established that coal burning was the main culprit: sulfuric acid particles were formed from sulfur dioxide released by coal burning, and this process was facilitated by nitrogen dioxide, another co-product of coal burning. The study shows that similar chemistry occurs frequently in China, which has battled air pollution for decades. An international team of scientists suggests that we must ramp up energy production by nuclear power if we are to succeed in warding off the worst effects of greenhouse gas emissions on climate change. The team suggests that beginning in 2020 we could achieve an annual electricity output of 20 terawatts without needing to develop carbon dioxide trapping and storage technology for the tens of billions of tons of emissions that would otherwise drive global warming to catastrophic levels. Some early twentieth century earthquakes in southern California might have been induced (man-made) by past practices that were used by the oil and gas industry. During the early decades of the oil boom, withdrawal of oil was not balanced by injection of fluids, in some cases leading to dramatic ground subsidence, and potentially perturbing the sub-surface stress field on nearby faults. Distant wastewater disposal wells likely induced the third largest earthquake in recent Oklahoma record, the 13 February 2016, magnitude 5.1 event roughly thirty-two kilometers northwest of Fairview, Oklahoma. 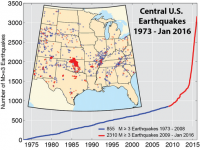 at the time, the Fairview earthquake was the largest event in the central and eastern United States since a 2011 magnitude 5.7 struck Prague, Oklahoma. The U.S. Department of Energy has a goal to develop and demonstrate transformative bioenergy technologies to fuel a more sustainable nation. Reaching that goal will require roughly a billion tons of biomass, so we will need to rely on a variety of resources to get the job done. 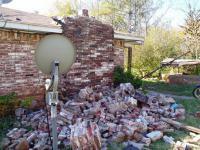 Oklahoma ordered the shutting down of 37 wells after Saturday’s 5.6 magnitude earthquake. Experts note that the significant increase in the number earthquakes measuring 3.0 or higher in Oklahoma has been linked to the practice of underground disposal of wastewater from oil and natural gas production. Only three earthquakes 3.0 magnitude or higher were recorded in 2009. Last year, the state had 907 such quakes. So far this year, there have been more than 400. The 31 May 2014 earthquake that rumbled below Colorado’s eastern plains surprised both local residents and local seismologists. The earthquake happened in an area that had seen no seismic activity in at least four decades. It was likely caused by the injection of industrial wastewater deep underground. New research shows actions taken by drillers and regulators can lessen risk in the case of earthquakes likely caused by the injection of industrial wastewater deep underground. A strong national commitment to nuclear energy goes hand in hand with weak performance on climate change targets, researchers found. 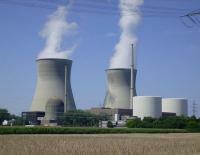 A new study of European countries shows that the most progress toward reducing carbon emissions and increasing renewable energy sources has been made by nations without nuclear energy or with plans to reduce it. Conversely, pro-nuclear countries have been slower to implement wind, solar, and hydropower technologies and to tackle emissions. The National Science Foundation (NSF) has made eleven awards totaling $55 million aimed at building research capacity to address fundamental questions about the brain and develop new innovations at the intersection of food, energy, and water systems. These four-year awards support twenty-seven institutions in eighteen eligible jurisdictions. Physics students from the University of Leicester have explored a feasible way to harness the power of earthquakes during a disaster in order to keep vital systems powered. By using a magnet inside a coil during the shaking of tectonic plates that occurs during an earthquake, the students suggest that the magnetic field created by the shaking could generate a current which could potentially be harnessed.